He lost a court case on a subject very dear to him. A federal judge today ruled that Trump cannot block Americans on Twitter simply because he doesn't like their political views. The ruling applies to both the official @potus account, and Trump's more volatile @realdonaldtrump. Blocking prevents Twitter users from even reading Trump's tweets (at least while they're logged in under the blocked account) and--more problematically under the First Amendment--prevents them from replying in the same forum, while allowing replies from people whose views haven't offended Trump or his social media team. It's been a busy news week for Trump's twitter account. Reuters reported on Tuesday that about 15 million of Trump's followers are fake, or nearly a third of the total. Most are nonpolitical, but some are known Russian "influencer-bots" whose only function is as propaganda and disinformation tools, and these accounts often opportunistically coordinate their message with Trump's in order to lure in his supporters. 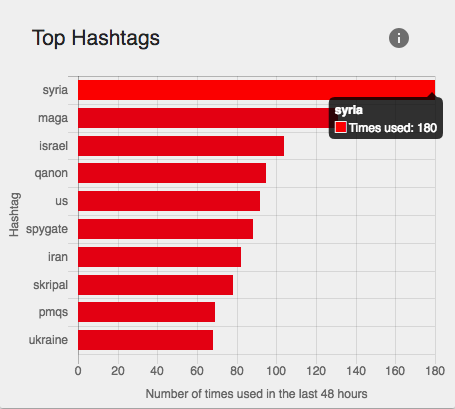 #MAGA and #spygate were trending on the Russian bot networks this week. It also came out this week that Trump is still stubbornly refusing to comply with requests from White House staff to use secured phones for his tweeting, or to have his phones regularly inspected by security experts. According to a member of Trump's staff, he says it is "too inconvenient" to keep having security updates done to his phones. Trump ran on a promise to somehow put Hillary Clinton in jail for maintaining an e-mail server as Secretary of State that in theory could have been vulnerable to foreign hacking. Censorship by government officials is bad, unconstitutional, and un-American. It's bad if a president, knowingly or otherwise, makes himself useful to disinformation campaigns aimed at Americans. Nothing is "too inconvenient" where American national security is concerned.